Contained inside of this wooden display case is one glass shelf that has been tempered for increate stability, durability, and safety. Glass shelves are a great choice due to the ease of maintenance and the clean look they create. There is no lack in quality of construction with this display case. The solid wooden construction is perfect for retail environment since it can hold up with the amount of traffic. The base has a built in storage are that can be locked. You can safely store important items in here with no worry of theft. Lights: None available on this item. The full vision style of this wooden display case is optimal for displaying products. It allows browsing customers the easiest viewing angles and more light is able to come into the case. 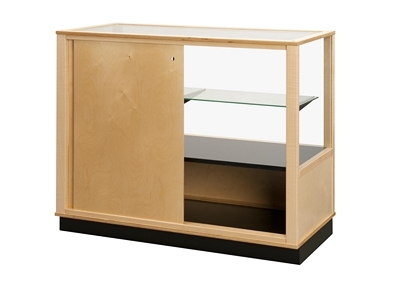 We also build custom wooden display cases with storage if this design does not fit your requirements exactly. Click here to view the full line of custom finishes we have available for this wooden glass display case.